The more cores—or processing units—a computer chip has, the bigger the problem of communication between cores becomes. For years, Li-Shiuan Peh, the Singapore Research Professor of Electrical Engineering and Computer Science at MIT, has argued that the massively multicore chips of the future will need to resemble little Internets, where each core has an associated router, and data travels between cores in packets of fixed size. This week, at the International Symposium on Computer Architecture, Peh's group unveiled a 36-core chip that features just such a "network-on-chip." 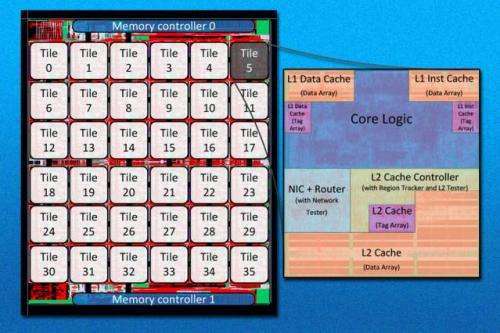 In addition to implementing many of the group's earlier ideas, it also solves one of the problems that has bedeviled previous attempts to design networks-on-chip: maintaining cache coherence, or ensuring that cores' locally stored copies of globally accessible data remain up to date. In today's chips, all the cores—typically somewhere between two and six—are connected by a single wire, called a bus. When two cores need to communicate, they're granted exclusive access to the bus. But that approach won't work as the core count mounts: Cores will spend all their time waiting for the bus to free up, rather than performing computations. In a network-on-chip, each core is connected only to those immediately adjacent to it. "You can reach your neighbors really quickly," says Bhavya Daya, an MIT graduate student in electrical engineering and computer science, and first author on the new paper. "You can also have multiple paths to your destination. So if you're going way across, rather than having one congested path, you could have multiple ones." But what happens if another core needs the data before it's been shipped? Most chips address this question with a protocol called "snoopy," because it involves snooping on other cores' communications. When a core needs a particular chunk of data, it broadcasts a request to all the other cores, and whichever one has the data ships it back. If all the cores share a bus, then when one of them receives a data request, it knows that it's the most recent request that's been issued. Similarly, when the requesting core gets data back, it knows that it's the most recent version of the data. Groups of declarations reach the routers associated with the cores at discrete intervals—intervals corresponding to the time it takes to pass from one end of the shadow network to another. Each router can thus tabulate exactly how many requests were issued during which interval, and by which other cores. The requests themselves may still take a while to arrive, but their recipients know that they've been issued. During each interval, the chip's 36 cores are given different, hierarchical priorities. Say, for instance, that during one interval, both core 1 and core 10 issue requests, but core 1 has a higher priority. Core 32's router may receive core 10's request well before it receives core 1's. But it will hold it until it's passed along 1's. Cache coherence in multicore chips "is a big problem, and it's one that gets larger all the time," says Todd Austin, a professor of electrical engineering and computer science at the University of Michigan. "Their contribution is an interesting one: They're saying, 'Let's get rid of a lot of the complexity that's in existing networks. That will create more avenues for communication, and our clever communication protocol will sort out all the details.' It's a much simpler approach and a faster approach. It's a really clever idea." "One of the challenges in academia is convincing industry that our ideas are practical and useful," Austin adds. "They've really taken the best approach to demonstrating that, in that they've built a working chip. I'd be surprised if these technologies didn't find their way into commercial products." After testing the prototype chips to ensure that they're operational, Daya intends to load them with a version of the Linux operating system, modified to run on 36 cores, and evaluate the performance of real applications, to determine the accuracy of the group's theoretical projections. At that point, she plans to release the blueprints for the chip, written in the hardware description language Verilog, as open-source code. A little disinformation here. Today's chips are typically 2 and 4, and then next generation will generally have 8, not 6. Also, buses are not a single wire, but many (up to hundreds of) parallel wires moving data around at gigahertz speeds. Anyway, good research on using many cores. This will be a very important area of research for the next 10 years. Six cores are part of the current generation. I have a six core machine. How is this concept different then those in GPUs? Yeah verkle likes to compose his own disinformation. So - can moores law be appropriately applied to the # of cores on a chip now? Yes. But that doesn't mean that computers will get that much faster. Rather, it depends on the task. For example, when I am writing this text, there is no way I can use 36 cores, because you cannot distribute a single, serial task. @doiea "They're already optimized to graphical (pixel and vector) operations, which may be both advantage, both disadvantage in many applications" [sic] Where did you get that grammar? He gots it from the 3rd world where they all understand everybody very well.